North Wales is already an adventure destination for all sorts activities including rock climbing, mountaineering and sea kayaking so adding paddle boarding to the list makes perfect sense. Within an hour's drive in any direction from the heart of Snowdonia you'll find lakes, coastline, rivers and estuaries all of which have their own unique character. With canals and white water rivers around Llangollen, mountain lakes and tidal estuaries in and around Snowdonia to sandy beaches and rugged sea cliffs on the Llyn Peninsula and Anglesey. If you haven't already paddled in North Wales it's time to plan a trip. This article is designed to point you in the direction of venues worth visiting. It is far from an exhaustive list, anyone with a map or guidebook plus some common sense will find loads more places to explore. All of these locations will be recorded in other places both online and in books. You will find more details about the specific venues by using the links at the end of the article. With common sense in mind it is worth highlighting that all the listed venues have associated hazards which you will have to assess. Even on the perfect day, water based activities can be dangerous. Any wind or current will be noticeable and cause more difficulty to a paddle boarder than to a kayaker. 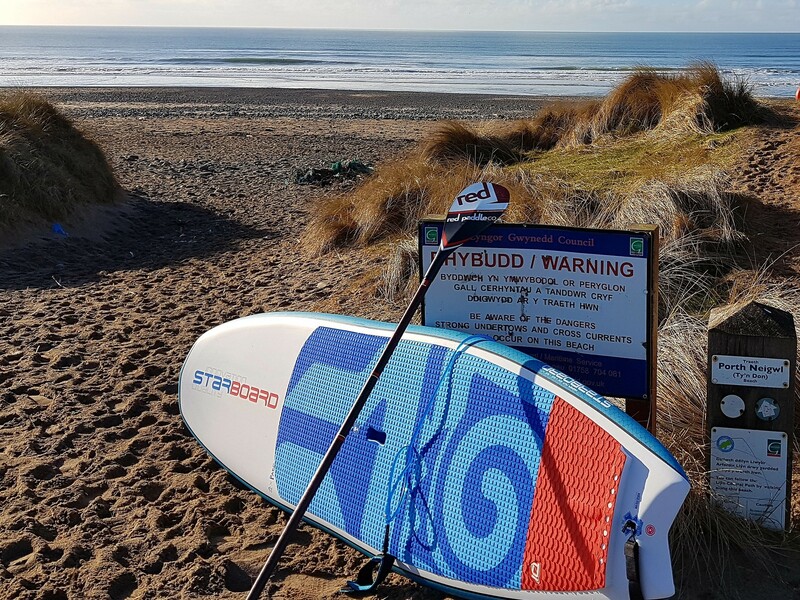 None of the North Wales venues have organised lifeguards or safety cover, if you get in to difficulty it will be up to you, other paddlers in your group and/or your point of contact on the land to rectify things. Know your limits and be very careful if you decide to push them! This is the most reliable surf beach in North Wales. Any swell traveling up the Irish sea will show here. You can surf here at all states of the tide with optimum conditions usually showing as the tide drops. On a big spring high tide waves can become very dumpy as the beach gets submerged. Being approximately 6km wide you will always be able to find space especially if you're willing to walk along the beach. There is a small free car park which is always full during the summer and when there are good conditions. Parking along the side of the narrow country access road is common on busy days but please park considerately and remember there are lots of residents who shouldn't have to put up with excessive noise and mess. Popular with kite and wind surfers the beaches at Rhosneigr can also be good for non wind powered wave chasers. There are a cluster of beaches stretching from one side of the village to the other. If you turn up at your chosen beach and it's busy just head to the next car park. If everywhere is busy you will usually be able to find some space at Treath Crigyll. The waves at Rhosneigr will always be smaller than those at Hells Mouth. Parking is often tricky in Rhosneigr especially in the summer and when the waves are good. A lot of the parking is in residential areas of the village so be considerate. Under the shadow of Snowdon, Llyn Padarn with it's sheltered lagoons is considered one of the most versatile paddling venues in North Wales. If the weather prevents you launching here it's definately time to head to the cafe. There are no launching fees but most of the car parks will charge. On a good day you can paddle around the lake and through it's lagoons surrounded by ancient woodland and the mountains of Snowdonia. Llyn Padarn is approximately 3km long and up to 450m wide so you'll never be to far away from where you started. There is a circular path that surrounds the lake which passes through the National Slate Museum, (well worth a visit). Llanberis village is only a short walk away and boasts plenty of outdoor shops and cafes. The largest natural lake in North Wales, over 6km long and 1.5km wide, Llyn Tegid is worth a visit if you want the big lake feeling. There is an established canoe trail which is linked below this article for you to download and follow. Prevailing South Westerly winds blow straight down the lake and can make for good downwind fun in the right conditions. There are plenty of parking options with most being located in or close to Bala. 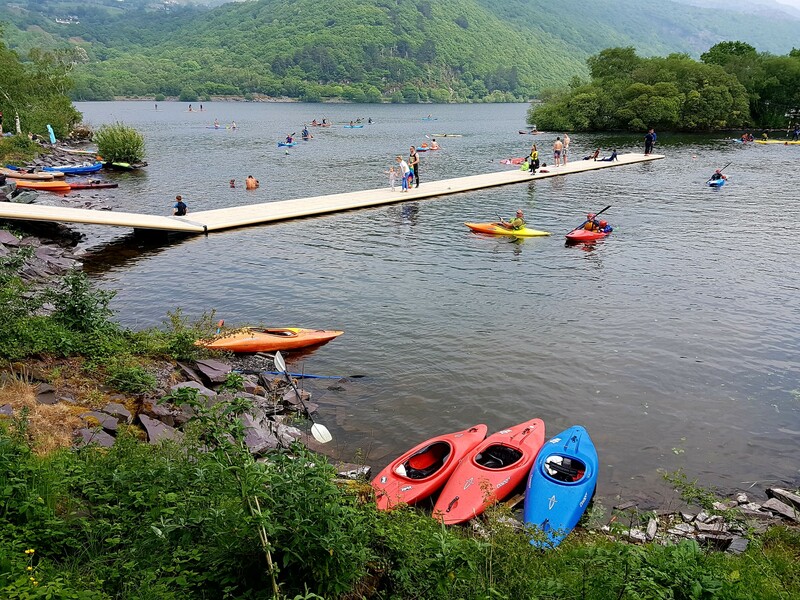 You will also need to pay the required launching fee to the Snowdonia National Park, there is a wardens office as well as a automatic machine located in the main access car park in Bala. Between Penmaenpool and Barmouth the Mawddach estuary, in the right conditions, makes for a nice paddle. With good weather and an accurate tide forecast you can paddle out and back from the same car park. If you want to run it in one direction you will need to arrange a lift or public transport to get back to your starting point. The mountains of Southern Snowdonia form the back drop and you can also expect to see plenty of wading sea birds along this route. The rail bridge near Barmouth is worth being aware of as it can become hazardous during times of high tidal flow. Other things to consider are mud flats and sand banks at low tide. There is ample parking in Barmouth and at Penmaenpool with public toilets. The pub at Penmaenpool is a great place for food and drink if time allows. Starting in the historic town of Conwy with its impressive castle this route winds it's way inland towards the mountains of Northern Snowdonia. A good place to start from is the car park known as "The Beacons" next to the Conwy mariner on the western shore at the mouth of the estuary. In the right conditions and using an incoming tide you should be able to get to the bridge at Tal y Cafn without to much difficulty. On route through the mariner you will pass beneath bridges and the famous Conwy castle, then, as the estuary turns towards the south an RSPB nature reserve, which at certain times of the year makes a resting place for hundreds of different migrating birds. The estuary then meanders and narrows as you get closer to Tal y Cafn. Exiting from the bridge at Tal y Cafn is possible but parking is very limited. With good planning and once the tide turns you can make a return trip to you starting point. Its is worth being aware of fast tidal flow and obstructions in the mariner making sure you give things like moorings and bridge stanchions plenty of room. At low tide you should also expect lots of mudflats and sand banks which aren't great if you need to cross them on foot! The town of Conwy is well worth a visit if time allows, you will find plenty of places to eat and drink and to plan your next trip. Dividing Ynys Mon, (Anglesey) from mainland Wales is the Menai Strait. This famous section of water along with it's iconic bridges makes for a great place to paddle. 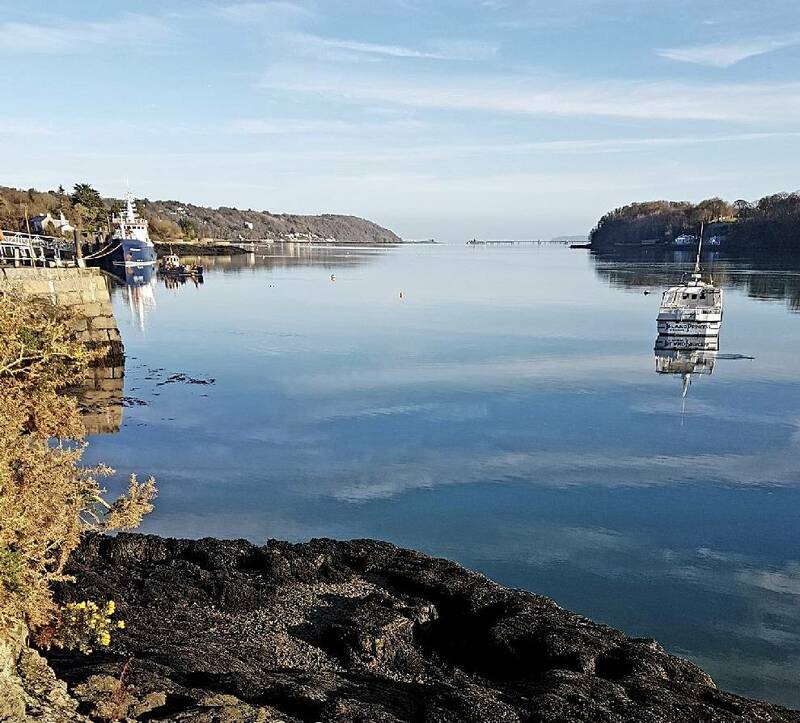 Due to the way the tide moves around Anglesey, the flows in the Menai Strait need to be understood before launching. The direction of flow changes at different times to the forecast high and low water, get your planning wrong and you'll struggle to get to your destination. A prevailing south westerly wind and an ebbing tide will cause wind against tide conditions. The area between the two bridges in known as the Swellies, the flow here can reach up to 8 knots. There are submerged rocks and underwater obstructions that create waves, whirlpools and currents which you will struggle to paddle against. The Swellies is a great place to explore, plan your trip wisely and you'll be well rewarded. Beyond the Swellies the nature of the Strait is slightly more relaxed, the flow eases slightly and the underwater hazards are few and far between. 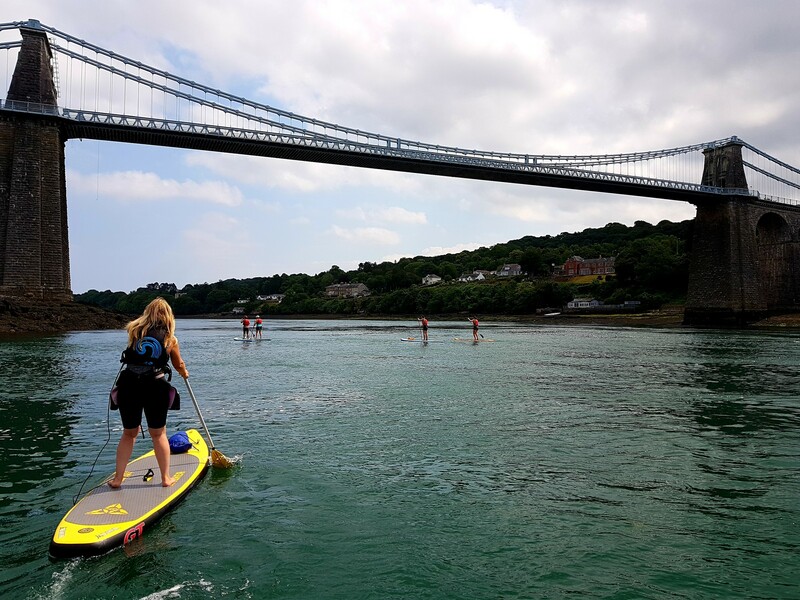 There are plenty of launching and landing spots between between Caernarfon and Beaumaris so choose your route sensibly and you can paddle on the Strait at any time of the tide. Famous for white water kayaking, rafting and fishing the river Dee around Llangollen is a reliable place to head for if you fancy a bit of white water SUPing. Paddling different sections of the river is possible. Each section will include a range of features some easier to paddle than others. Surfing on river waves can be great fun and unlike waves on the sea, river waves can roll on for hours at a time, you just need the skills to stay upright! Good river access can be found from the car park at River Active on the side of the A5. If you've never paddled on white water before you would be well advised to go with an experienced coach to get an understand of the additional considerations required to negotiate moving water. Paddling on a canal can have quite a relaxing feel to it. The slow moving water, the landscape, the tunnels, the bridges, the smells and the noises all combine to create a very unique experience. Not having to worry about things like tide and waves makes route planning relatively straight forward. Another benefit is that there are plenty of places to stop for food and drink so paddling out to a pub for lunch before returning home is easily done. The section between Llantysilio and Froncysyllte is well worth a visit. It travels through open countryside, the town of Llangollen with all its amenities and finishes at a world heritage site, the Froncysyllte aquaduct. If you are not a member of British Canoeing or Canoe Wales you will need to buy a license from the Canal and River Trust. Considering the Llyn Peninsula receives thousands of tourist visits each year the area has done well to retain it's traditional charm. You will hear the Welsh language in all the towns and villages on the Llyn as it is the first language for the majority of the non-tourist population. Porthdinllaen is a small cluster of buildings tucked away below some high sand dunes and a golf course. Public road access finishes about a mile before the village at a large National Trust car park. 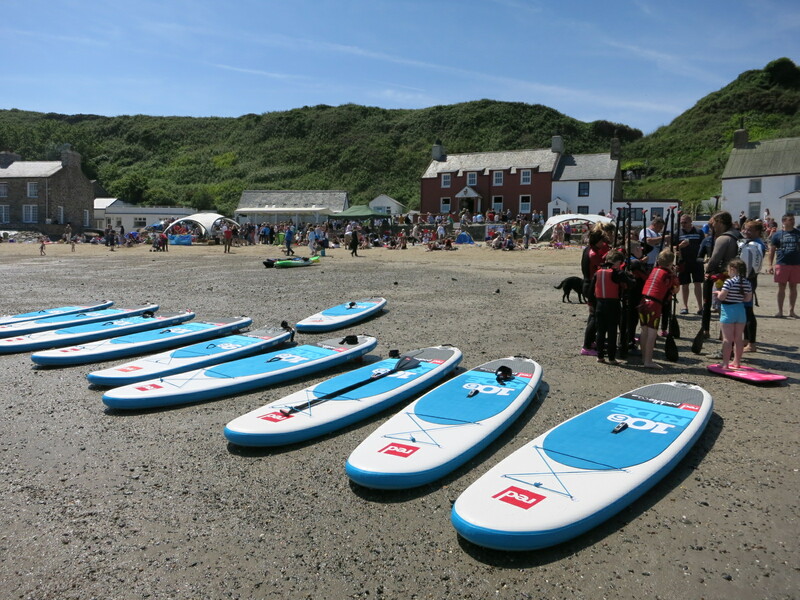 To get to Porthdinllaen from the car park a good option is to launch from the sandy beach in Morfa Nefyn and paddle along the coast to reach Porthdinllaen. Due to it's sheltered location and warm shallow water the bay is home to one of the largest seagrass meadows in Wales. The village has a famous pub located on the beach, the Ty Coch which obviously forms the hub of the village. You can easily land here and enjoy some food and drink along with everyone else. If you want to explore further you can paddle out towards the headland where you will pass the recently renovated RNLI lifeboat station. Beyond the lifeboat station the coastline starts to get more rugged and rocky. The point of the headland is exposed to wind and currents so make sure you are happy with the conditions before going further. You will regularly be joined by seals who like to sunbathe and fish off the rocky headland. A popular sandy bay located on Holy Island at the western edge of Anglesey. Access to Treaddur Bay is made easy by the A55 dual carriage way. The village has plenty of parking as well as a variety of places to eat, drink and sleep. The bay is relatively sheltered unless there is a strong prevailing wind in which case you might fancy playing in the surf. In calm conditions paddling within the bay is pretty straight forward. Traveling out of the bay in either direction the coastline quickly gets more rugged and options for an easy landing are fewer. That said, there are some picturesque beaches and bays worth exploring if conditions permit. Going in a WNW direction from Trearddur Bay to Porthdafarch you will discover impressive cliffs and caves. Porthdafarch is a small sandy bay which is always busy in the summer. There is a public toilet and parking facilities located at the back of the beach. Paddling in a SW direction towards Rhoscolyn the cliffs are smaller. Porth Diana is the first real option to land and makes a nice place to aim for. Continuing beyond Porth Diana there are very few options for an easy landing. It is worth being aware of the tides when paddling at Trearddur Bay, although their effect is minimal within the bay, once outside the bay you will need to have worked out what effect the tide will have on your trip. Tidal rates at Rhoscolyn beacon can be up to 4 knots and beyond Porthdafarch is a world famous tide race called Penrhyn Mawr where tidal rates can be more than 6 knots. Both Rhoscolyn Beacon and Penrhyn Mawr are places which need to be respected and are not recommended for novice paddlers. As you can see from this shortlist, once you are in North Wales there are plenty of options available without the need to spend long hours on the road. 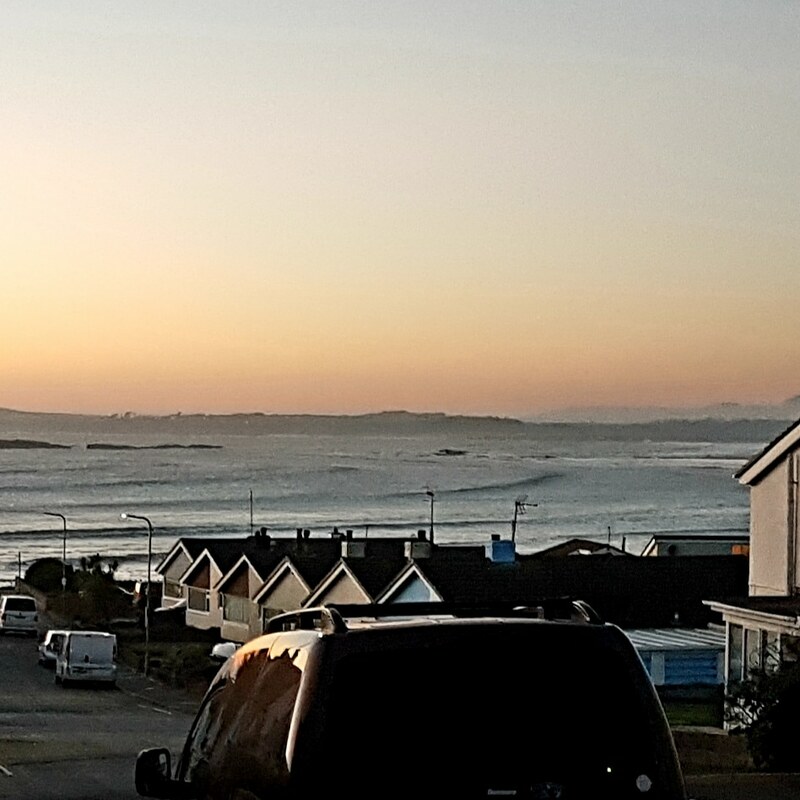 Coming with an open mind and a couple of different board options means whatever the weather throws at you there will be a useable paddling venue not to far away. Being a popular tourist destination you can expect plenty of non-paddling activities if you want to mix things up. The area is rich in history and character so even wandering around the local towns you will find interesting things to see and do. You might also want to head to one of the famous attractions like Zip World or Surf Snowdonia, both attract visitors from across to UK and further afield.